All Ireland Qualifiers – Well done to Jack and Seamus and the entire Leitrim team and management on their qualifier win over Louth last Saturday. Their reward was a clash against Monaghan in Páirc Seán on Saturday at 2.30. Best of luck to Jack, Seamus and all involved. Division 3 – We are away to St Mary’s on Sunday at 12 noon. Wedding Bells – We extend our warmest congratulations to Mark Mitchell, Trean and Tracey Dillon who were married in Tracey’s native Ballinamuck last Saturday. Mark has represented the club at all levels with distinction and we wish you both a lifetime of health and happiness. 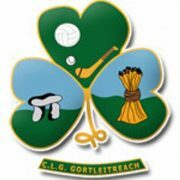 Comhbrón – We extend our sympathies to the Kennedy family, Mohill GAA and the wider Mohill community on the passing of Mary Kennedy at the weekend. Ar dheis Dé go raibh a hanam.